In’Easa mabu Ishtar is an international spiritual teacher and counselor. She is an embodied Ascended Master Channel who has worked with the Masters for the past 15 years, regularly channelling high frequency wisdom teachings for groups and individuals. 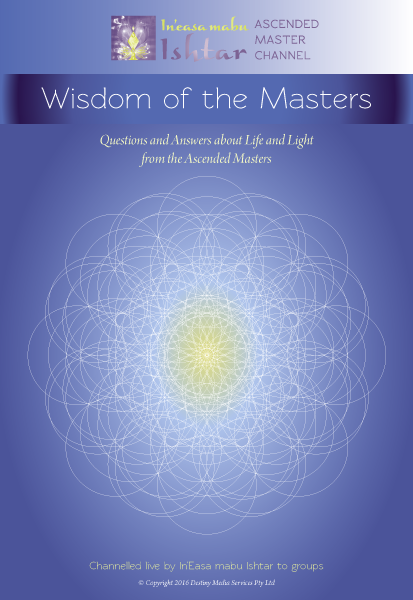 Her work is completely guided in service to the mission of the Ascended Masters to assist and support humanity to evolve its consciousness on the Earth. Ishtar was directly taught to open her pillar of light initially by Saint Germain, then Serapis Bey, and Lord Kuthumi for six years. Presently, she is working directly with Maitreya and Mary Magdalene to awaken the God (Christ) Consciousness on the Earth. Ishtar is an accredited teacher of the Divine University and her name means the ‘Christed Light (In'Easa) from the lineage of Ishtar’. She channels and transmits a high frequency energy that offers healing and wisdom to assist you to be held and supported as you grow and evolve into the truth of your being. Ishtar's greatest gift is to guide all souls is to ground and anchor their spiritual wisdom into their lives and to begin to live this as their divine truth on the Earth. "This may often be a challenging journey of faith and trust where your old beliefs and attachments need to be released," says Ishtar. "Yet, when you are truly ready to surrender to this journey then magical things begin to happen in your life to assist you to continue in the knowledge that you are supported and loved." Over the past 15 years Ishtar has been trained by the Ascended Masters through a deep connection of the heart and many, at times challenging, spiritual initiations. In co-creation with the Ascended Masters Ishtar has created two online correspondence teaching programs – Open to Channel School, an Advanced one-year program that teaches students to open to receive from their Divine Self – all that they are from the higher frequency vibration of Source. The other program is called The Masters’ Way, a self-mastery program with practical tools and applications for your life. This program teaches students to understand and work with the energy of light and love in their life. Both courses have students from all over the world. Ishtar also teaches a course for healers to work directly with the Ascended Masters - Universal Rays Healing. Some of Ishtar’s earliest memories include standing on her front lawn looking up to the sky and asking the ‘Martians’ why they had left her on the Earth and wanting to know when would they come back to get her and take her home. Over the past two decades she has rediscovered her strong connection to Sirius, Chiron, Orion and Arcturus. But she says that she now knows and understands that 'home' is wherever you are in spirit - "for spirit is your home". She initiated her self-mastery process over a seven-year period on a sub-tropical 10-acre country property in Australia. She shared this space with her now ex-partner, best friend and twin flame John, three dogs, some lovely chickens, lots of wild kangaroos, rabbits, goannas, snakes, lizards, the odd koala, and myriad bird life, as well as many beautiful teachers that came into her life to support her. It was from here that she began to share the wisdom of the Ascended Masters when she opened her channel pillar and for six years channelled the Ascended Master teachings live to groups every week on a Friday night. Ishtar was guided to move to this property in 2000 from Sydney where she had lived most of her life working as a journalist. She had led a colourful and busy life running her own small media business for several years after spending 20 years working on mainstream women’s’ magazines and newspapers including Cosmopolitan, Good Housekeeping and also as the editor of Family Circle. From an early age Ishtar had a keen interest in all things related to philosophy, religion and spirit - reading Plato, Carl Jung and Krishnamurti in her teens. She also spoke to spirit through medium practices and studied astrology and the tarot in her early 20s. When she was 18 she traveled to France where she lived for three years. While she has had little contact with France and its language for more than 30 years, she says she now finds it interesting that for the past six years she also has been teaching her courses in French and now has 5 of her manuals translated into French. Over the years Ishtar traveled widely to many countries around the world. In the late 70s, on a trip to India, she spent some time in Poona with Bagwan Shree Rajneesh, who later became known as Osho. One night she says Bagwan appeared to her sitting on the edge of the bed, although it looked like his physical body he was in spirit form. She had spent the day trying to decide whether to stay in Poona and become a sanayassin or return home and was undecided. Bagwan had woken her in the middle of her sleep to tell her that her time would come later and to go home. This proved to be correct. In her early 20s Ishtar suffered bad health due to injuries sustained in a car accident when she was 17 years old. She underwent nine painful surgeries until she was 25, spending much of her time in and out of hospital. At 24, Ishtar developed a drug addiction, which she was to battle until she was 31 when she had a near death experience and experienced the first of many higher-self walk-ins. Ishtar spent 18 months fighting her addiction and won. She now sees this new consciousness came to assist her to anchor her being in the physical world so she would let go of her judgment of humanity and her desire to leave the planet so that she could continue her mission. She had been asked to make a definite choice to remain on the Earth and anchor her codes of light. This began a challenging journey of self love. In her early 40s she again suffered ill health due to cancer and had more surgery. This encouraged her to focus even more upon her body and to begin to live her life in a more healthy and balanced way and to reconnect with her spirit more deeply. Ishtar began to consciously connect with spirit and to listen more to the guidance that was always there for her. She began attending courses and retreats, as well as reading books on energy healing and spirituality. Over a 20-year period Ishtar trained in many modalities including Ascension Healing, Crystal Dreaming, Pranic Healing, Reiki, Theta Healing, Aromatherapy (level 5), Massage Therapy, Spiritual Counselling, EFT and TFT, Australian Bush Flower Essences and Light Essences. She met Sri’ama Qala, an embodied channel and divine spiritual teacher, in 1998 and began to channel the Ascended Masters in 2003 when doing a Sacred Mystery School with Qala. The Masters gave her spiritual name directly to her during this school. Today Ishtar lives in the Ashram of the One Heart, which is her home as well as a sacred space for others to come and commune with the Masters. The Ashram is devoted to the work of the Ascended Masters. It is situated near Sydney and holds retreats and meditations each month to support and develop spiritual community. Ishtar also travels to Europe and the USA each year where she runs groups and workshops. Her work is completely oversouled by the Ascended Masters and the Family of Light.